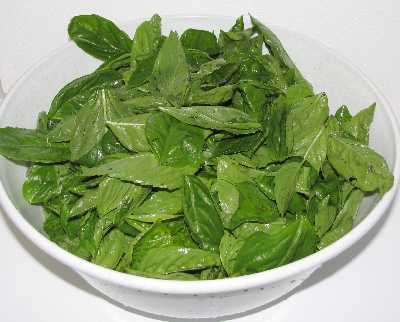 How to Easily Make Pesto from Fresh Basil! EASY and illustrated instructions! As expensive as basil pesto is in the stores, you'd think it was difficult to make; but it is incredibly easy. 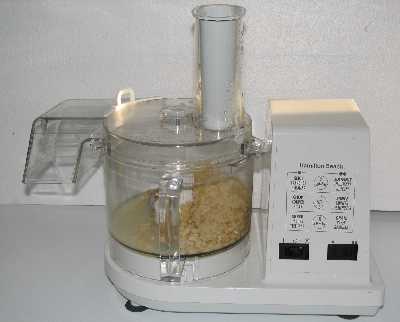 The only equipment you need is a food processor, blender or chopper. 1 tablespoon "fruit fresh" or 1 tablespoon of lemon juice. 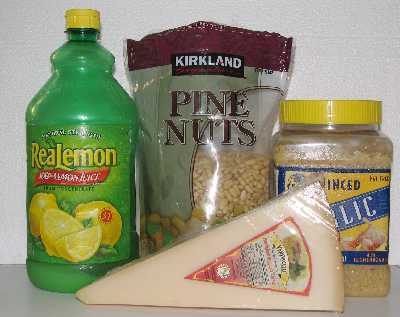 Fruit fresh is available at most grocery stores where canning supplied like pectin and pickling salt are sold. It is basically a form of citric acid and vitamin C, that helps prevent the pesto from turning brown upon exposure to the air. 1/4 cup Olive oil. It should be the "extra virgin" variety, not the ordinary cooking olive oil. 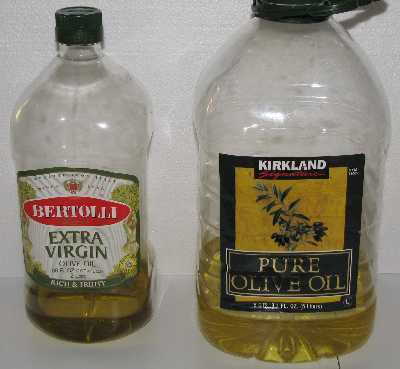 If it is extra virgin, it will say that on the label: see the photo for an example of extra virgin (at left) next to cooking olive oil (at right). Makes about 1 cup or prepared basil Pesto! Step 1 - Pick the leaves off of the stems. Discard any flower buds, stems or leaves that aren't in good shape. All we want are leaves; small, medium or large; as long as they are a healthy green, not brown or molding! Step 2 - Wash the basil. Just wash them in a large bowl under cold water, no soap! 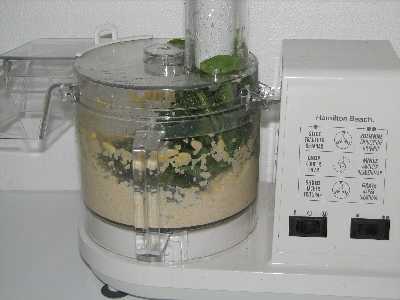 If you don't have a food processor, you can use a blender, and possibly a chopper. It would be fairly tedious to do this by hand, but I'm sure it can be done that way, too. 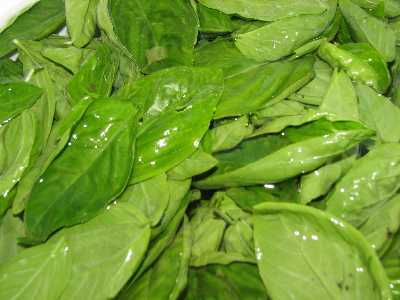 Now start stuffing basil leaves (in small batches) into the food processor and chop them into the garlic, olive oil and pine nuts. Chop the mix until it forms a thick, smooth paste. Did I mention you need to grate the Parmesan cheese first? Then just add it to the food processor and blend! NOTE: if you intend to freeze the pesto, leave the cheese OUT and add it when you thaw and use the pesto. Cheese doesn't freeze well. Adding 1 teaspoon of sugar or Stevia (in a prepared form like Truvia, it measures same as sugar; if you use another form, you'll need do your own conversion) - or Splenda, if you prefer, to the batch really seems to bring the flavor alive. Try it and see! The pesto will keep in refrigerator for about a week, or you can freeze it and it will last for 3 to 6 months. A visitor writes to suggest freezing the pesto in ice cube trays. When it's frozen, just pop the cubes out of the tray and put them into a freezer bag. When you need them, just take one of two of the cubes out - so easy! Most people serve it over pasta or use it to season fish and chicken dishes. Herbs and oils are both low-acid and together could support the growth of the disease-causing Clostridium botulinum bacteria. University (Clemson, University of Georgia, etc.) food science researchers do NOT recommend canning herbs . However, herbs and herb mixtures like pesto CAN be safely frozen! 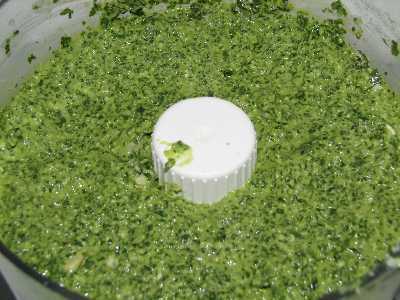 Pesto is an uncooked seasoning mixture of herbs, usually including fresh basil, and some oil. It may be frozen for long term storage. That's the recommended method to save your homemade pesto for the dark nights of winter! Also, oils may be flavored with herbs if they are made up for fresh use, stored in the refrigerator and used within 2 to 3 days. Fresh herbs must be washed well and dried completely before storing in the oil. The very best sanitation and personal hygiene practices must be used.